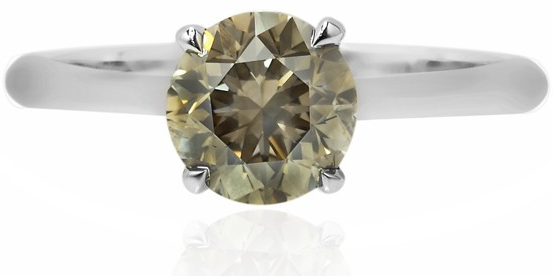 Natural gray diamonds, like all color diamonds, get their color from the inclusion of foreign elements during the diamond's formation under the Earth. In this case, the gray color is caused by the inclusion of hydrogen, although it may also be caused by boron. Regardless, these diamonds come in a variety of different shades and hues, which is what gives them their very unique color. Gray diamonds are sometimes called charcoal gray, steel, slate, silver and pigeon and have few intensities. Their tones range from pewter and nickel to deeper hues like graphite and lead. 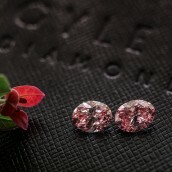 Gray diamonds are mined in India, Russia, Brazil, South Africa and Australia, the home of the Argyle mine. Gray diamond production accounts for 2% of its color diamonds (the majority being champagne diamonds), although they are renowned for their pink diamonds. Interestingly, gray diamonds, like blue ones, are semiconductors of electricity – unlike the majority of diamonds, including most colors and colorless, which are non-conductors. Its levels of color intensity are Light Gray, Fancy Light Gray, Fancy Gray, Fancy Dark Gray, and Fancy Deep Gray. The diamond's colors appear will cooler or warmer according to whether they contain the cooler blue or green, or warmer browns and yellows. Depending on how they are set in jewelry, the darkness or lightness of the diamond can be more or less pronounced. Surrounding it with colorless diamonds really allows for the diamond color to shine through the most and take center stage in the piece, especially if there are secondary colors present in the center diamond. Gray appears as a secondary color mostly in green and blue diamonds, but can also be found in yellow, chameleon, violet and purple. The Hope Diamond, the most famous diamond in history, is officially considered Fancy Gray Blue. There are no famous gray diamonds, as they were not historically popular, but some of the most famous blue diamonds in the world have the official color designations of "Grayish Blue" – including the famed Hope Diamond, the Sultan of Morocco, and the Wittelsbach Diamond. The Hope Diamond (previously “Le bleu de France”) is the largest deep blue diamond in the world. The 45.52-carat (9.10 g) Fancy Deep Grayish-Blue VS1 diamond was mined in India and its dimensions are 25.60mm (length) × 21.78mm (width) × 12.00mm (depth). Legend has it that the original form of the Hope Diamond was stolen from an eye of a sculpted statue of the goddess Sita in a Hindu temple. The temple priests then laid a curse on whoever might possess the missing stone and the “curse” of the Hope Diamond was born.The Hope Diamond and its associated curse were subsequently blamed for, amongst other fatalities, the beheadings of Louis XVI and Marie Antoinette. September 1812 is the earliest point when the history of the Hope Diamond can be definitively ascertained. 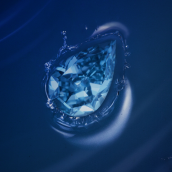 A blue diamond with the same shape, size, and color as the Hope Diamond was recorded in the possession of the London diamond merchant Daniel Eliason. The Hope Diamond appeared in 1839 in a published catalog of the gem collection of prominent British banker Henry Philip Hope, who died the same year. His oldest nephew, Henry Thomas Hope, inherited the Hope Diamond. Following further inheritance issues and multiple changes in ownership, the Hope Diamond finally found its way into the hands of diamond merchant Harry Winston in 1949. On November 10, 1958, Winston donated the diamond to the Smithsonian. Traditionally, the Hope Diamond was in a necklace displayed in The Smithsonian in an oval setting surrounded by a series of white diamonds; however in 2009 it was displayed as a loose gem. On November 18th, 2010, the Hope Diamond was displayed in a new setting, with the design chosen from three possibilities in an online vote of more than 100,000 people. The Hope Diamond was shown in this setting for a year before being returned to its traditional one. The Wittelsbach was a 35.56 carat Fancy Deep Grayish Blue VS2 diamond, cut with an unusual pattern of 82 facets. Since Madrid archives have been destroyed in the Spanish Civil War of 1936-1939, the diamond’s earliest record dates from 1664, when it was given by Philip IV of Spain to his daughter Infanta Margareta Teresa, then 15, for her engagement to Emperor Leopold I of Austria. In, 1675 at the young age of 21, Infanta died after being weakened by too many miscarriages. Her husband inherited all her jewels and in turn, left them to his third wife, Empress Eleanor Magdalena, who passed the Great Blue Diamond to her granddaughter, Archduchess Maria Amelia. 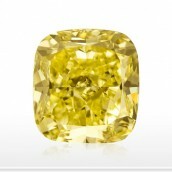 In 1964 it was bought by a private collector, and in 2008 the Wittelsbach Diamond was sold at a Christie’s auction to the famous jeweler Laurence Graff for $24.3 million. Graff re-cut the diamond, losing 4.45 cararts, to 31.06 carats “to remove damage to the girdle and enhance the color.” It is now a Fancy Deep Blue IF (Internally Flawless). The cushion-cut, 35.27 carat, Fancy Grayish-Blue Sultan of Morocco has an unknown clarity. It is believed the diamond emanated from India in the mid-19th century, however how it reached Europe, for how much, previous owner and the like are not known. The name suggests a possible linkage with the ruling families of Morocco, the Sultans, however there is no evidence to confirm this. The diamond was definitely in the possession of the Yousupov family, a Russian noble family of Tartari descent, in 1840. In 1922, Prince Felix Yousupov, the last Yousupov prince and best known for his direct involvement in the murder of Rasputin, sold the diamond to Cartier’s of New York. In 1972, the diamond was sold privately to an anonymous buyer in San Francisco, California for USD250,000. The buyer was apparently linked to the Vice President of the "Bud" Ehresman company who had the stone delivered to him by the famous jeweler, Laykin et cie, based in Los Angeles, California.